Jefferson starter Michael Dominguez gives props to his teammates for their effort behind him on the mound. As the old saying goes, confidence is like a dragon where, for every head cut off, two more heads grow back. 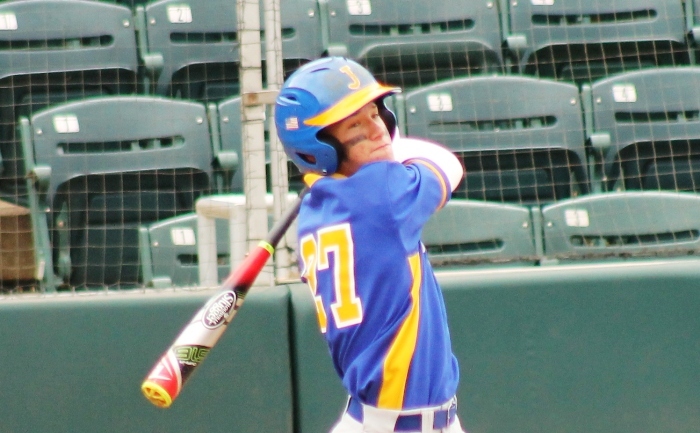 Playing in their first state Final Four since 1985, the Jefferson Dragons exhibited their many heads, as they dispatched the Clay Blue Devils with a 7-2 victory in Wednesday’s 6A state semifinal at Hammond Stadium in Fort Myers. 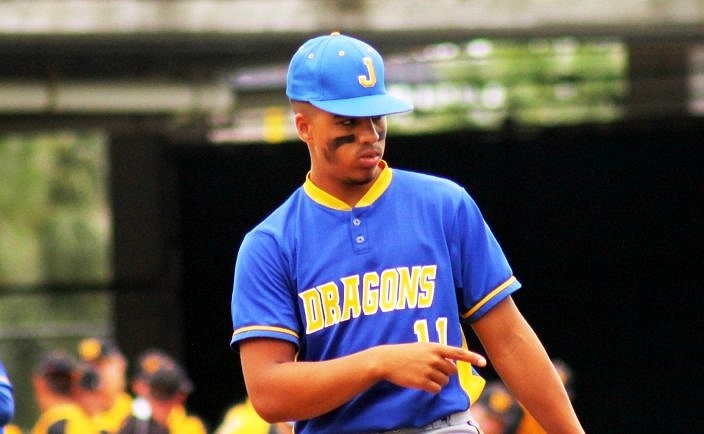 Behind another strong start from ace Michael Dominguez and some timely offense, the Dragons earned their chance to play for the program’s first state title in its 78-year history. Jefferson (21-8) will take on the Merritt Island Mustangs in Thursday afternoon’s title game, after the Mustangs also advanced with an 8-2 win over Barron Collier in the other semifinal. Dominguez did the heavy lifting on the mound to pave the way, earning the victory after pitching into the sixth inning, before reaching his pitch limit. The right-hander piled up 12 strikeouts in five full innings of work, while surrendering two earned runs on seven hits and a walk. Although it did not show, he admitted afterwards that he was very nervous making the start. Oscar Galvez plunks a single into right field in the first inning, as part of a 4-for-4 day for the Dragons’ second baseman. The latter part of the Jefferson batting order did a lot of the damage, as the last four batters in the order accounted for seven of the team’s eleven hits. With the biggest moments primarily occurring with those hitters in the batter’s box, they delivered with several key hits that paved the way to victory. The Dragons drew first blood with some unearned runs that were the difference in the top of the third inning. Andrew Mathis drew a lead-off walk, Robby Martin rolled a single through the left side and Charlie Welch reached on an error that brought in the first run. After Clay recorded a pair of pop outs to nearly escape the jam, Ty Evans broke things open with a liner past third base that plated two, as Evans slid safely into second base. Freshman Sal Vega then brought his teammates roaring out of the dugout in celebration, as he blasted a two-run home run high over the left field fence for a 5-0 advantage. Clay (24-7) got on the scoreboard to break up the shutout in the fourth. Chase Holman drilled a shot into the left field corner and managed to reach third base standing up for a lead-off triple. Courtesy-runner Blake Parker then came in when a balk was called on Dominguez. The Blue Devils inched closer with another run in the bottom of the fifth. Tyler Spence lined a double into the left-center field gap, and with two outs he was running hard and scored after a high infield pop off the bat of Josh Lemen landed on the grass for an RBI single. The Jefferson Dragons show their appreciation for ace starter Michael Dominguez, after pitching his team to a 7-2 lead over the Clay Blue Devils in the sixth inning of Wednesday's 6A state semifinal. Jefferson got those runs back in the top of the sixth. Vega reached on an error and Oscar Galvez followed with a great bunt that went for an infield single. Miguel Denson kept the chain moving with a single up the middle, which resulted in the runner at second getting picked off after getting caught up on the base paths. A liner from Mathis was snared by Conner Solomon at shortstop, but Martin and Welch both followed with RBI singles that pushed things to a five-run lead for the Dragons. Martin came on in relief for the final six outs, and he held the rope to finish things off and preserve the victory. Needing just 17 pitches, Martin posted two scoreless frames to earn the save. Although Tyler Spence reached on an error to give Clay one last hope in the seventh, Martin responded with a swinging strikeout for the final out. With just one last game left between them and immortal glory, the Dragons look to bring the same relaxed demeanor to Hammond Stadium on Thursday. Having come so far after waiting for so long, the team looks to remain grounded and true to what has brought them this far.